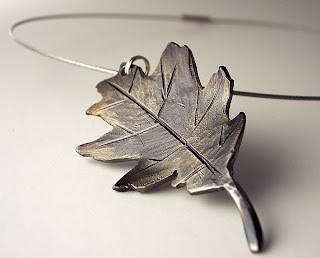 Although the leaf pictured in this post is what caught my eye and drew me in when I stumbled upon today's shop (it's my own personal I WANT, I WANT! item), it was the truly unique items I saw in the gallery combined with the unusual list of sections in this shop that kept me there long over my usual bounce ratio for a shop... and kept me coming back to look again too! This guy doesn't just make jewelry, you see. He's selling modern metal jewelry, art, furniture, clocks, jewelry displays and much more. I know most everyone on Etsy has unique items to sell, that goes without saying. And here on this blog I love highlighting those who I think escalate into the uber-unique categories But this man? This man is not just in an uber-unique category, he's created his own stratosphere all it's own. Who is this unique mastermind? Every item is handmade and designed by a self taught metal artist; Timothy Adam. So take a minute to stop by Timothy Adam's shop and take a look around! I venture that you won't be disappointed. And pop on over to his Handmadeology site as well if you're an online seller or considering becoming one. The advice there is excellent and won't steer you wrong! TO VISIT TIMOTHYADAMDESIGNS YOU CAN CLICK THE PICTURE ABOVE OR, IF YOU'D RATHER, CLICK RIGHT HERE!